City councillors in Surrey, B.C., voted down plans to build an eight-lane commuter road through Bear Creek Park Monday night -- though opponents of the development may still have their fight ahead of them. 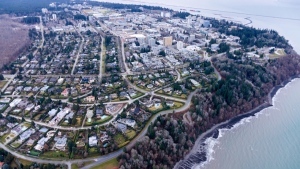 After months of public outcry, councillors voted 6-3 against extending 84th Avenue eastward at King George Highway, which would have run through two salmon streams and green space bordering Bear Creek Park. "The passion around Bear Creek, and any lands joining Bear Creek Park, is huge in this city," Councillor Barbara Steele said at Monday's meeting. "People just aren't going to accept anything that's going to bother or disturb Bear Creek." Critics say the park is home to great horned owls, bald eagles, deer and other wildlife. Hundreds of opposed residents turned out to protest the plans, but victory celebrations may be short lived. Instead of permanently scrapping Bear Creek plans altogether, the city decided to move in favour of public consultations. "I beg everybody who is involved in this issue to please stay with it," resident Ken Bennett said. "The people of Surrey will decide this issue." Residents in Surrey, B.C., are upset over a proposal to extend a road through Bear Creek Park. Oct. 3, 2009.